If you are looking for a Wholesale Larimar Supplier, you are here. Look no further than Navneet Gems for your Larimar Gem needs!! We have sourced our Larimar rough from the exclusive Dominican Republic, Larimar mines and we import between 50 and 300 Kilograms per month, depending on our monthly requirements for Wholesale Larimar orders from our clients. 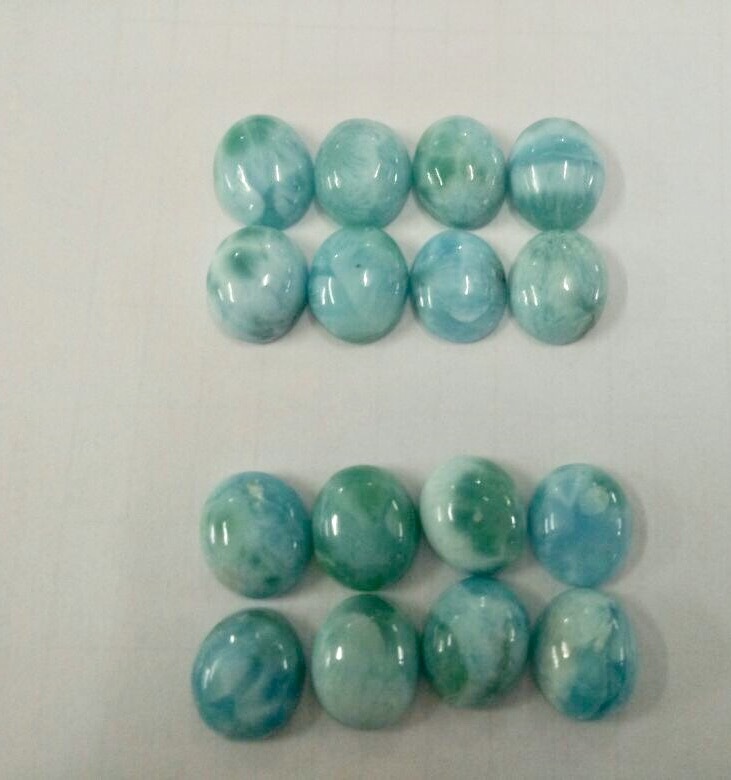 Our Factory in Jaipur, Rajasthan, India is currently producing these Larimar Gems in Cabochon form. 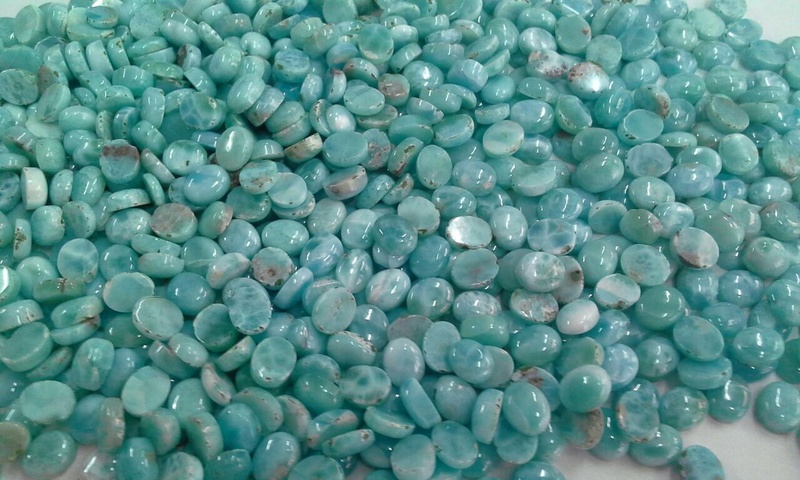 We are producing Wholesale Larimar Cabochons in bulk for Wholesale Larimar sales and we ship to Larimar Jewellery Producers worldwide, who buy from us. Our factory in Bangkok adds the cherry on the top of the ice-cream to provide the perfection in the Larimar Gemstones, that our customers expect. The lowest Quality Larimar Gemstone is a Green -White -Blue mix and some pieces have in them the natural inclusions of face cracks. Medium Quality Larimar is a Greenish-Blue, meaning in Gemological terms that the dominant color is Blue with some Green color in it. This gemstone could also have some Whitish- Blue colored tones. The Best Quality or Pure Blue Larimar stones could be mixed with Light Blue and Dark Blue as it is a Natural Larimar Color Gemstone. 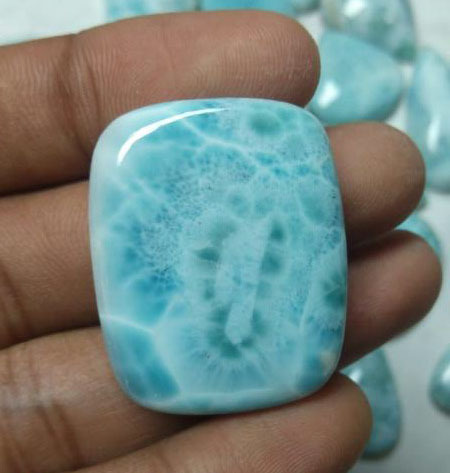 See Photos of some of Our Wholesale Larimar Cabochons below in the different Gemstone Qualities. But aren’t they all beautiful gems? This is the 2nd quality (top) and the 3rd quality (bottom) of the photo. What separates us from other Wholesale Larimar Bulk Producers? Jaipur, India is well known for a lengthy history of truly professional gemstone and jewelry craftsmen and women and with low costs of production and labor. In our own Jaipur Factory, loose Larimar is manufactured by our own highly trained and experienced craftsmen. We have also Quality Control in place both there in our Jaipur Gemstone Manufacturing and also here in our Bangkok Gemstone Factory. This helps us to provide the best consistency in quality for the value of the Larimar Gems which is key in Wholesale Larimar Cabochon Manufacturing. We at Navneet Gems proudly produce the same quality of Larimar Gemstones consistently for our clients who expect this for their Larimar Jewelry. We can also produce for you, Wholesale Larimar Jewelry per your specifications at either of our gemstone and jewelry factories. We monitor the mining conditions of our Wholesale Larimar and our Jaipur Larimar Manufacturing, to not take advantage of poor conditions for workers. Our ethical sourcing is important to us and we will never let this go for the sake of profit for our Larimar Gemstones or any of our Wholesale Gemstone products. 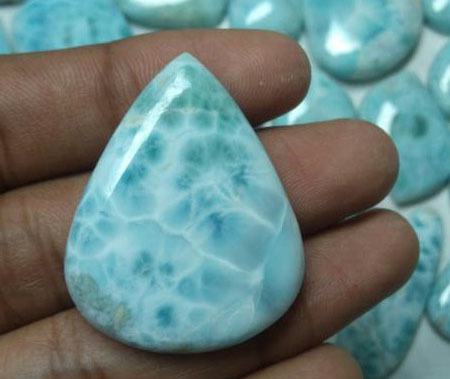 If you would like to have a Wholesale Larimar Stone Supplier providing you consistently with good quality Larimar Cabochons then please Contact Us now and we will show you what we can do for you. Here we have workers ready to reply quickly to your requests and inquiries.